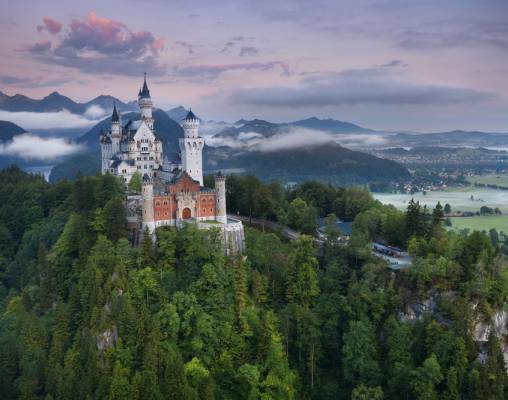 Whimsical palaces and gingerbread castles set the theme of our fairytale rail tour, during which we relax in the wonderful Bavarian countryside, visit the capital of Bavaria, Munich, and take a trip by train up the Zugspitze, the highest mountain in Germany. Today we travel by Standard Class train to visit Munich. 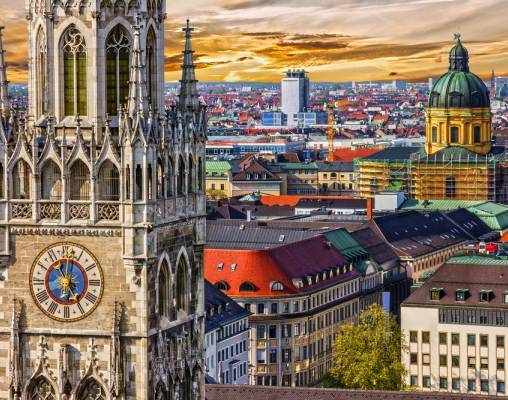 As the capital of Bavaria, the city has a wonderful collection of museums, art galleries and architectural treasures - along with a fantastic selection of excellent shops and restaurants. We enjoy a guided tour to introduce the sights of the city, before enjoying time to explore at leisure. Be sure to visit Marienplatz, the city's historic center and still its vibrant hub today. Here you can see the impressive neo-Gothic Town Hall, or you could take the lift up one of the copper-domed towers of Munich's imposing cathedral, the Frauenkirche, for great views over the city. Today we enjoy one of the region's most popular rail journeys, as we take an excursion on the Zugspitze Railroad, reaching the summit of Zugspitze - which at 9,718 ft (2,962 m) is the highest mountain in Germany. Our train departs from the town center and climbs along the mountain base, passing the Eibsee Lake on its way to the Zugspitzplatt, situated by the impressive Schneeferner glacier - Germany's largest. Today's full-day excursion is arguably the highlight of our tour, as we visit two of Europe's most beautiful castles. We begin with a visit to King Ludwig's marvelous childhood home of Hohenschwangau. Situated on a verdant and tree covered hill, this yellow fortress is covered in towers and turrets that lend an air of the fanciful to the entire building. Here, we learn about the fascinating history of the two structures. 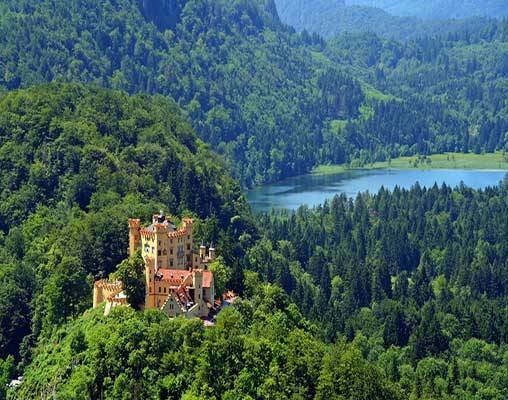 Hohenschwangau was built on the site of the 12th century Schwanstein Fortress but fell into disrepair during the 18th century Later, it was sold on, and then lovingly reconstructed by Ludwig's father in the 1830s. Surprisingly enough, for the time it was built, Neuschwanstein was equipped with many modern conveniences but incredibly was only occupied for 170 days before Ludwig was deposed. We take in the opulence of this awe-inspiring palace - one of Germany's most popular attractions - with its sumptuous wood carvings, beautiful chandeliers and lavish paintings which adorn the majestic rooms. 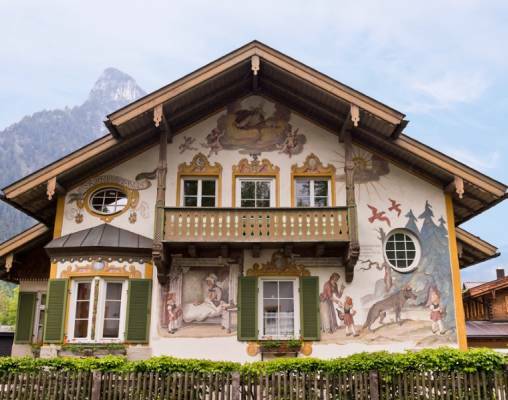 This morning we visit Oberammergau for a guided tour through its pretty streets with elaborately decorated homes featuring historic and fairytale paintings. The town is internationally famous for its celebrated Passion Play, which starts the town's residents and is held once every ten years. The Passion Play has now become an internationally recognized event and is heavily attended by Christians from all around the world. 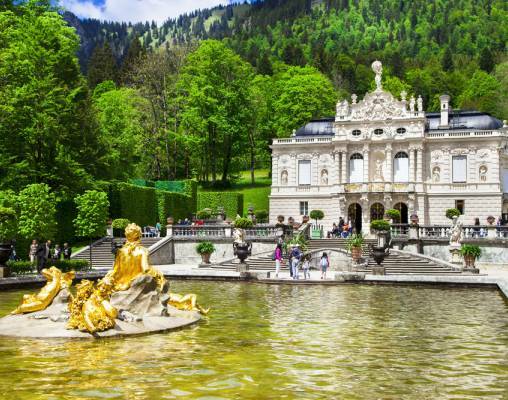 In the afternoon, we visit Linderhof, the smallest palace commissioned by Ludwig II. The whole complex incorporates a range of architectural influences, and here we explore the striking Hall of Mirrors which was supposedly used by the king as a type of living room, he was known to spend a lot of his time sitting here reading solemnly, candles would burn through the night and create a unique atmosphere because of the myriad of reflections generated in the room. 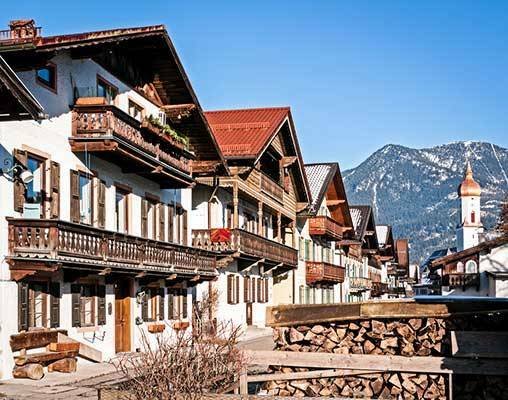 The superb family-run 4-Star Reindl's Partenkirchner Hof Hotel is located in the heart of Garmisch-Partenkirchen, just a short walk from the station. It combines the hospitality and tradition of a Bavarian inn with modern luxuries and the comforts one would expect of a 5-Star hotel. Extensive wood paneling gives the hotel a warm traditional feel, perfect for relaxation after a busy day. The hotel has two restaurants, a bar, and lounge, as well as a wellness center with an indoor heated pool, fi tness equipment, a steam bath, saunas, a relaxation room and a beauty and massage room. The rooms are furnished in traditional style and feature the very best of modern comforts. Each room is equipped with a telephone, a radio, a television, a desk, a minibar, a safe, a hairdryer and bathrobes. The high-speed Eurostar trains link St Pancras International in London with Paris and Lille in France as well as Brussels in Belgium. Eurostar's Standard Class coaches feature two seats on either side of the central aisle, most of which are arranged in an 'airline' seating configuration with drop-down tray tables. There are two tables for four per carriage. Passengers traveling in Eurostar Standard Class coaches can take advantage of the Bar-Buffet which sells a range of snacks, meals, hot and cold drinks - including Champagne! Thalys is a brand co-owned by German, Dutch, French and Belgian state railroads, and runs rail services linking Paris and Brussels with Amsterdam or Cologne. The trains are similar in design to French TGVs and can reach up to 190mph (305km/h) when traveling on dedicated high-speed lines. Comfort 1 (First Class) passengers benefit from spacious seating and are usually served complimentary light refreshments once underway. Both Comfort 1 and Comfort 2 (Standard Class) passengers have access to the Thalys Bar, which serves a selection of snacks, meals and hot and cold drinks during most journeys. We enjoy a journey on the narrow-gauge Zugspitze Railroad on some of our tours. The line takes us from the charming Bavarian town of Garmisch-Partenkirchen on an 11-mile journey to the peak of Germany's highest mountain - overcoming a height difference of 2,897ft. From the base of the mountain, the scenery becomes ever-more dramatic, with the spiky, snow-covered peaks towering over dense patches of woodland below. After pausing at Eibsee station, our journey continues into the mountains, using a series of wide curves to gain height. Zugspitze Railroad then passes through Höllental or 'Hell Valley' named for its dramatic slopes and narrow gorge that made climbing the mountain difficult. We then run through an area thick with pine trees before disappearing onto a long tunnel built to protect the railroad from the most extreme weather. We emerge near the summit of Zugspitze, where the views out over Bavaria and Austria are incredible. 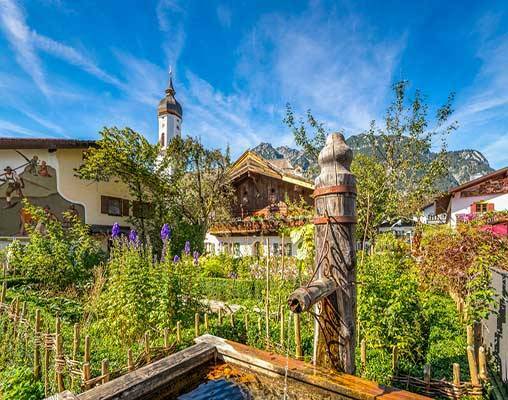 Click here to view testimonials for Fairytale Castles & Bavarian Alps. Enter your details below if you would like to be notified when 2020 dates and prices are available for Fairytale Castles & Bavarian Alps. Prices are correct at the time of publication, however are subject to change at time of booking. Hotel and Rail accommodations listed above, are subject to change based on availability at the time of booking. Prices are land only, per person based on double occupancy.